So let's consider two of the leaders in the industry, Aqua America (NYSE:WTR) and Connecticut Water Service (NASDAQ:CTWS), to see which company affords investors the best choice in terms of getting their feet wet (or wetter) with a water utility investment. Providing water services to customers for more than 130 years, Aqua America is the second-largest publicly traded water service provider by market cap. From humble beginnings in Pennsylvania's Delaware County, Aqua America now serves more than 3 million people across eight states. At the other end of the the water utility pool is Connecticut Water. The largest New England-based publicly traded water utility, Connecticut Water serves about 129,000 customers in Connecticut and Maine. To round out this introduction to the the two companies, let's compare them on some important metrics to gain better insight. Based on this peek at the company's financials, there is no winner. Connecticut Water, apparently, had more to show on the bottom line last year, but it's Aqua America that has been more successful over the past three years at converting shareholders' investments into profits. Now that we've dipped our toes in the water, let's jump in with both feet and get to know these two companies better. When considering water utility stocks, one of the most important factors to look at is the company's customer base, for relying too heavily on any one market is a significant risk. In this regard, Aqua America has the edge over Connecticut Water. With regulated operations in eight states, Aqua America is far less susceptible to local adverse weather conditions (among other things) than Connecticut Water, which operates in only two states. Although Aqua America largely depends on Pennsylvania -- the state accounted for 52% of operating revenue in fiscal 2016 -- the situation is far less worrisome than Connecticut Water's reliance on Connecticut to provide 95% of operating revenue during the same period. The diversified customer base affords Aqua America another advantage: potential acquisitions. Often, water utilities will seek acquisitions in proximity to their current operations to achieve greater efficiencies. Although organic customer growth is common, it doesn't compare to the growth that could be attained through acquisitions. In fiscal 2016, for example, Aqua America completed 19 acquisitions, which yielded 15,300 more customers and an additional $8.2 million in operating revenue. Connecticut Water, on the other hand, completed none. For fiscal 2017, Aqua America has four pending acquisitions, which will add almost 9,000 customers. Connecticut Water gained 4,700 water customers and 3,000 wastewater customers through an acquisition in February, and has another one pending, which will add 4,800 more water customers. However, in this area Aqua America has the edge. Generally speaking, the water utility industry is not one synonymous with tremendous growth. Consequently, investors will often turn to these stocks as dividend plays. WTR Dividend data by YCharts. 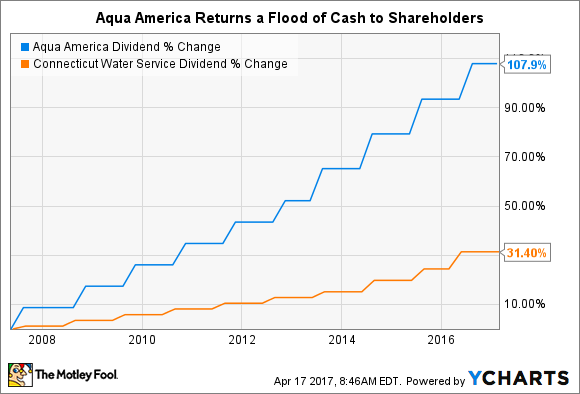 Here again, Aqua America retains the upper hand, growing its dividend at considerably greater clip than Connecticut Water over the past 10 years. Moreover, Aqua America's current payout constitutes a 2.30% dividend yield, which is more enticing than Connecticut Water's yield of 2.12%. Aqua America clearly has the edge over Connecticut Water in numerous ways: a more attractive customer base, greater growth prospects, and a more attractive dividend. There is, in fact, little to suggest that Connecticut Water offers a more compelling proposition than Aqua America. That being said, Connecticut Water isn't a bad option in and of itself. If one were assembling a basket of water utility stocks, Connecticut Water would certainly deserve a place. So let's consider price tags. Perhaps valuations will turn the tide in Connecticut Water's favor. WTR PS Ratio (TTM) data by YCharts. Based on these metrics, there's insufficient evidence that Connecticut Water is a better value. 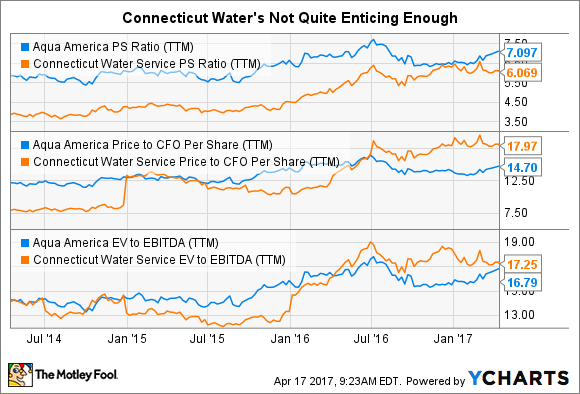 Although Aqua America is more expensive in terms of trailing sales, it makes up for this by trading at a discount to Connecticut Water in terms of cash from operations per share. And the fact that Connecticut Water is valued more highly in terms of enterprise value to EBITDA is just icing on the cake. Connecticut Water doesn't have enough growth ahead of it to warrant the higher price tag. Clearly, Aqua America has the more convincing metrics in this showdown. Investors can monitor how well the company executes its growth-through-acquisition strategy in the future and whether it, in turn, translates to dividend growth. Size isn't everything, though, so investors should keep an eye on Connecticut Water as well. It's possible that it expands its customer base so extensively in Connecticut that it is able to achieve exceptional efficiencies and return more cash to shareholders.